When Rib Shakk closed down earlier this year we lost one of our go to rib / dirtbag / not so guilty pleasures restaurants. Anthony’s sous vide ribs were a succulents joy, but that is all in the past. Of course there is Red’s, but if you can get a table good luck and if I’m honest I don’t love their ribs as much as everyone else seems to. So we had what marketing folk call a gap in an emerging market, that is until The Pit opened. 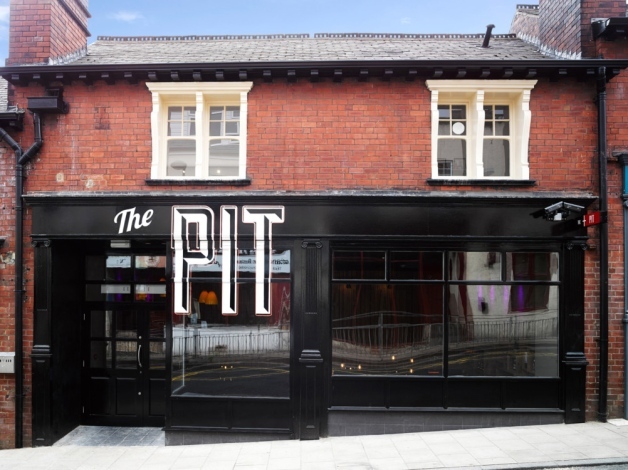 Situated at the other end of town, The Pit is also all about the barbecue: pulled pork, ribs, burgers, wings, nachos… you get the chargrilled message. It’s also huge – the spacious interior used to be part of a nightclub and it’s been given an intelligent designer makeover into a contemporary american vibe, by way of Merrion Street. It’s also part of the ambitious and successful Arc Inspirations Group, the guys behind The Box, Trio, Napa and The Arc etc so we should expect great things. First impressions are good and on the lunchtime we visited, the staff were on the case, friendly and attentive. After a drink at the bar, we took to our booth (I do like a good booth). At first, the menu is slightly bewildering I’ll be honest – there is a lot to choose from. But if you like this kind of food, and you know the difference between a Po Boy and a Big Link Dog, you’ll be right at home. 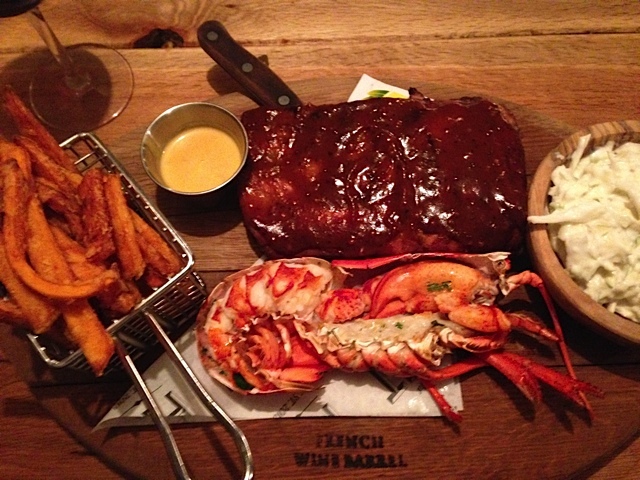 We fancied the burger and lobster combo made famous by the eponymous swanky London restaurant chain, but the fillet burger was disappointingly off so we all opted for the ribs and lobster. This was the most expensive item on the menu too (why do I always do that?) and quite steep at £25.95 although it looked impressive. Okay, there is half of a (small) lobster, a side of ribs, fries, slaw but still a little on the pricey side for me. I noticed other items such as straight forward burgers were also on the wallet stretching scale for what they were – it did feel a little like the expensive fit out needed to be paid for in some way. The food was good, the ribs excellent – probably the best in Leeds right now, smoky, succulent with still some bite – the lobster was a little bland, (it tasted like it was probably frozen) and other stuff is standard fare although the sweet potato fries and mac & cheese were nice alternative sides. I do think sometimes it’s hard to really excel with this type of food as ultimately it has to be the basics done really well. Perhaps I’m being too harsh but I do think that they will have to up their game to compete and take a look at the prices. I’ve said it many times, but some restaurants in Leeds charge London prices without the accompanying quality of service or food. I wouldn’t put The Pit in this category, but if you fancy a plate of nachos, a couple of burgers or sides of ribs, throw in a few beers and before you know it, you’re easily North of £50. In my book, everything has to be brilliant to sustain those prices. But The Pit is cool, make no mistake about it and any place that has a den in the basement with two ping pong tables available for hire, has to be good. The beer selection is superb and the wine sensibly priced, but this is a beer joint primarily although the cocktails are excellent, as I can testify). It’s location in the burgeoning ‘Northern Quarter’ will mean custom from the arena and out of town visitors.